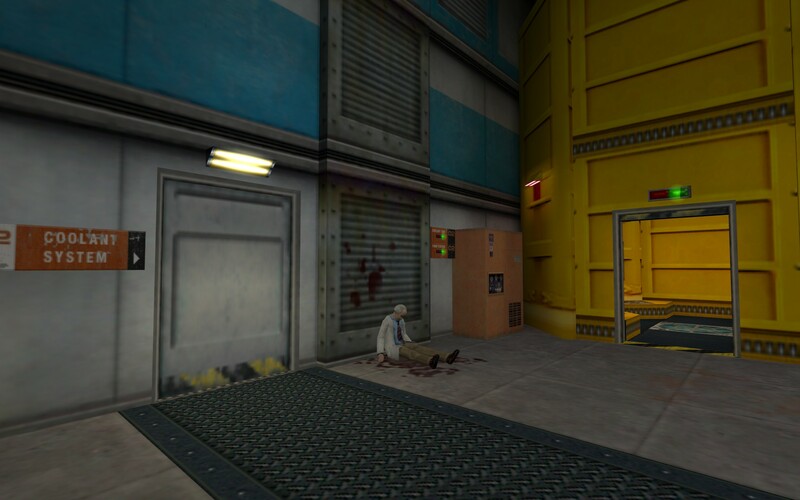 Half-Life: Anti-Climax is my take on the "battle you have no chance of winning" the G-Man offers you once you decline his job offer at the end of the Half-Life campaign. Is there truely no chance to win or can you lead Gordon to victory and freedom? 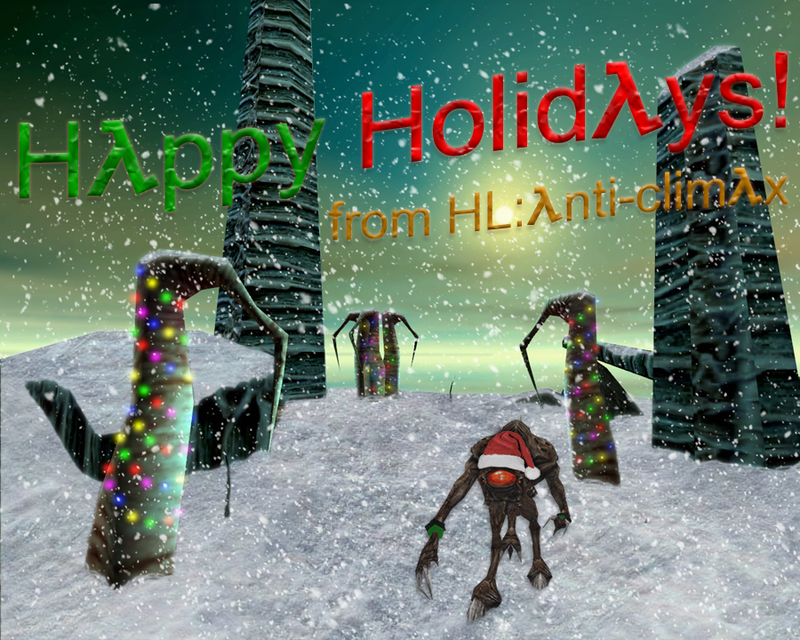 A look at gameplay progression, a new Lambda Lab and a very merry Xen-mas! Welcome to a new HL:Anti-Climax update! Near the end of this article I'll show off some freshly compliled new content and we'll get to the holiday season spirit, but first a look at the planned gameplay progression! As you might have seen already, I'm trying to stick to vanillia Half-Life content. The only custom content I'll allow myself to use are modified version of the originals because of technical reasons, as I've described in an earlier update. I'm constantly looking at the original designs made by Valve to see if I'm staying true to the Half-Life feeling and still trying to improve on that design and add my own insights to it. So far, I'm pretty pleased with the design and the comments from the community have been widly positive! 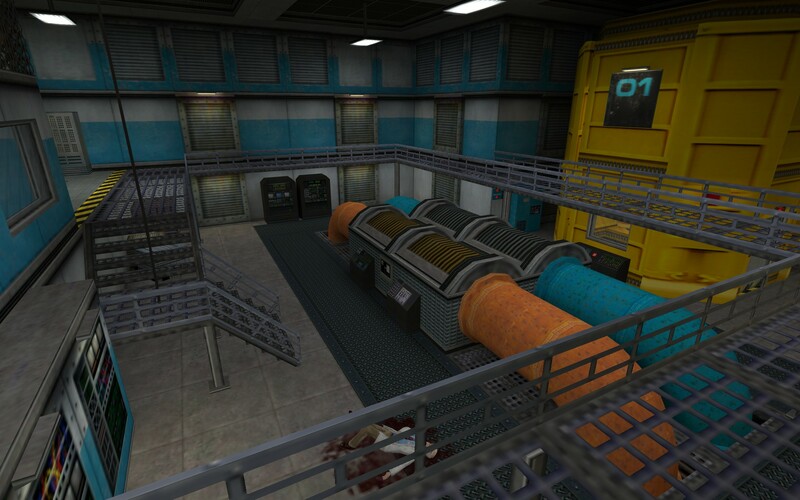 So, nearly all level desgin in Half-Life is extremely linear. You start at point X and work your way forward to point Y. Sometimes point Y is a visible goal but mostly it's just a general direction the player is lead towards or forced into. For Anti-Climax I want try a different approach. Firstly, I have very unique starting conditions, since you spawn (point X) right into the final battle (point Y). So the linear line from start to finish is virtually only a few seconds in length. Since the player has no chance to win under these conditions, he'll step off the linear path and take one of the alternative paths (points Z) that have opened up to him. Making decisions along the other paths will change the conditions of the entire world. At any point he can decide to return to point Y and see if the changed conditions are enough to win the fight. Maybe other paths can provide something or maybe paths already ventured have also changed again? 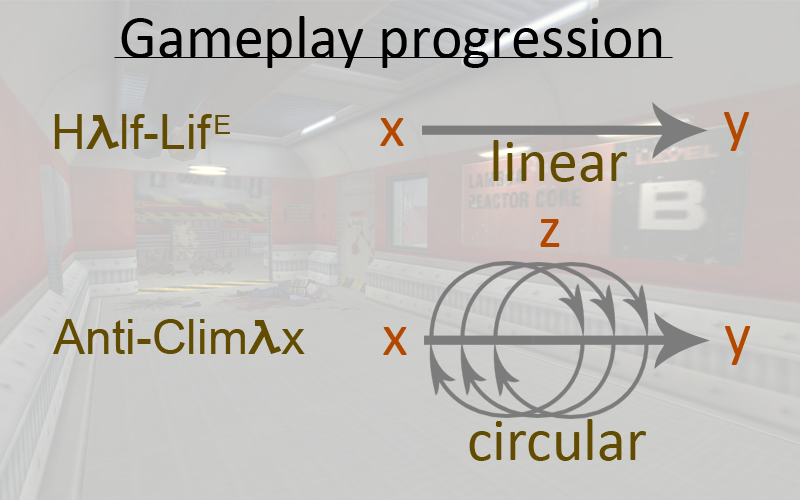 This design concept results into a circular gameplay progression, which is quite alien to Half-Life but hopefully very interesting to play! I've recently added more to one of the paths the player can take, which is this new lab in the Lambda Complex! So, that pretty much wraps it up for today's update. One last thing to tell is that I initially wanted to get this project done by the end of 2018 but I'm pretty certain I won't be able to finish it within that time frame. 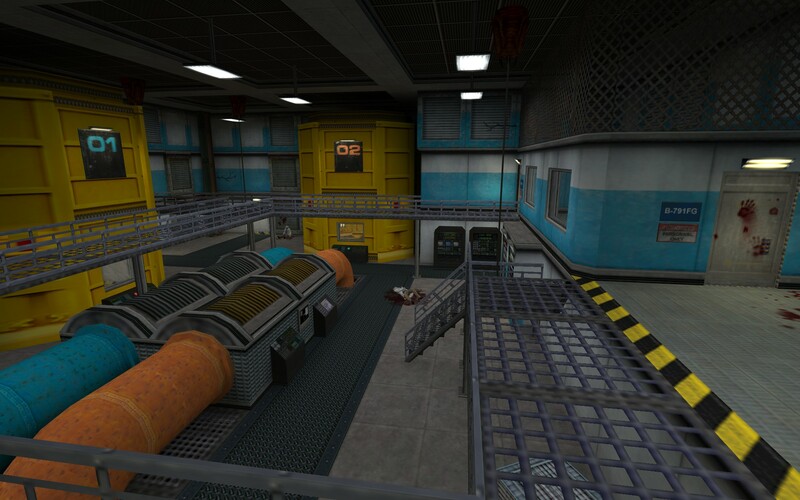 But I've learned that (by virtue or necessity) Half-Life fans are patient people, so I bet you guys won't mind playing this MOD sometime in 2019. I wish you all a very merry X(en)-Mas and until the next update in 2019! Mapping looks great and non-linear progression sounds interesting. Only thing that doesn't click with me is it being one single map. It would be great to experience a longer mod from someone with your enthusiasm. Nonetheless I am excited to see your progress, good luck. Thanks! The reason why I'm keeping it small is because I want to get it done within reasonable time. Its something fun I can work on in my free time without it becoming a burden of many months or even years. I don't mind if its a small mod as long as it's fun to play and I managed to get my vision across to the player. Sounds interesting. Is it really going to be only one map? What a fantastic approach to your narrative. I am hyped :) Merry Christmas! Very exited by revealing the principle of gameplay progression. Cool but would a gameplay video be a better idea to show off your principle?